explicitly categorized, allowing for the rapid development of a variety of training site systems. premium features of the LMS Learn dash – the #1 plugin on education field. It gives users more conveniences in learning as well as training experience. Students. Design interactive learning experiences that map to your curriculum and class level. Add photo galleries with captions and images that students can pan and zoom in to. Drag and drop video, historic speeches, music, touch, and better understand concepts. And students can use Member Account, Author to create their own books, reports, lab guides, and field trip logs. Udetor – Premium LMS Education WordPress Theme is designed to process the full and perfect – similar to a high-end technology product. Udetor has been fully designed from learner needs, business purpose training. Then, to meet the powerful features and features, Udetor’s sitemap system has been built with over 300 pages of functionality. Since then all of the Udetor interface components have been explicitly categorized, allowing for the rapid development of a variety of training site systems. Whenever you need to create an education website, you need a turn-key learning management system (LMS) to manage your courses, lessons, users and even membership. There are a few solutions available for WordPress and LearnDash is the best one (and the most popular one)(see why here and here). 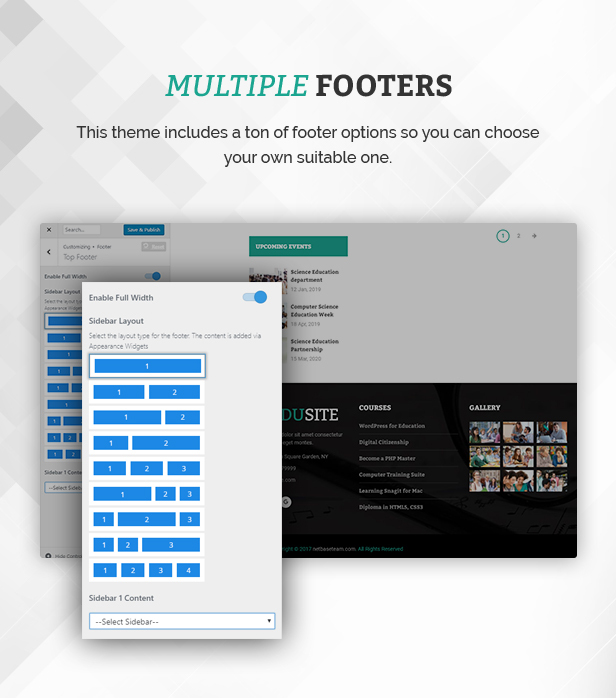 It’s simply the most feature rich WordPress LMS! IMPORTANT: Because of the LearnDash Terms and Conditions, our theme does NOT include LearnDash in the download package. You must buy the plugin on their page separately. Udetor Standard: Udetor is a specially designed based on UX/UI standard for all kinds of complete e-learning education service; it is not just a normal WordPress Theme. You will find the high quality in the Udetor interface that cost thousands of dollars. One important thing in this theme is the training premium features of the LMS Learn dash – the #1 plugin on education field. It gives users more conveniences in learning as well as training experience. 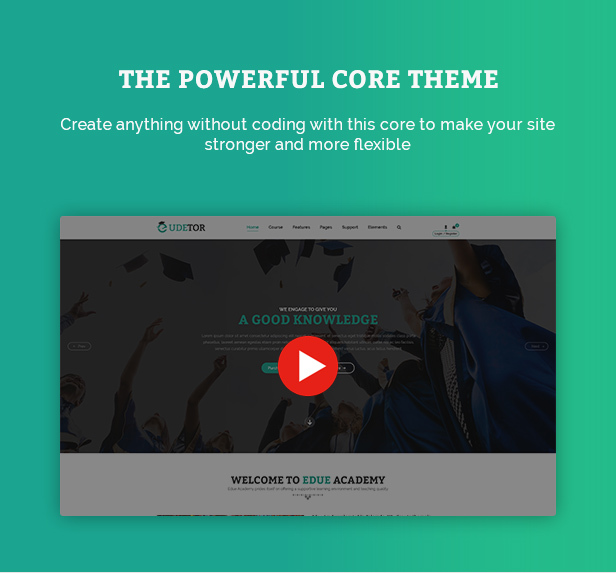 Udetor Academy: This fantastic theme is designed for all schools and education Academy. Become an author for earning money is so easy with some clicks on the Udetor theme. It helps you create your courses, projects, lab notebooks, and other learning materials for Online Market or Your Students. Design interactive learning experiences that map to your curriculum and class level. Add photo galleries with captions and images that students can pan and zoom in to. Drag and drop video, historic speeches, music, touch, and better understand concepts. And students can use Member Account, Author to create their own books, reports, lab guides, and field trip logs..
Further more, the theme is really friendly and useful because it helps customers find the online courses and create many types of course quickly without any trouble. 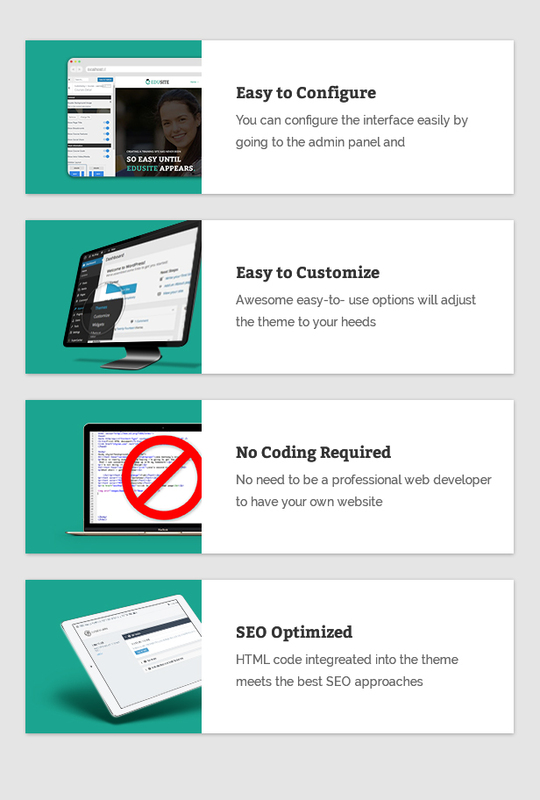 The most important thing that makes our theme stand out of other competitors is a Powerful Core theme that helps admin create anything without coding any line. The core theme is integrated BBPress, Event features, Gallery and Live Customizer. Admin can change the header, layout product, page, font color, and so on with a few clicks. Make your site at the high level. 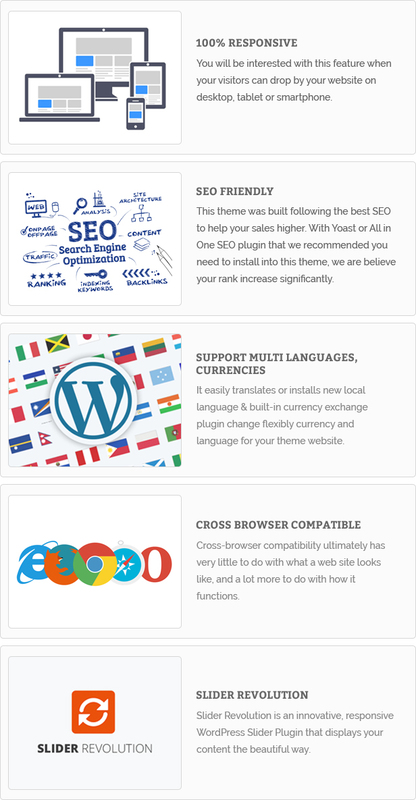 This theme is easy to use and install or configure, make your education site in a few minutes. If you have any trouble, we have a dedicated team are available to support you whenever you need with strong support ticket system. HOW UDETOR WORKS FOR CLIENT? Step 2: Customers can select and compare multiple products together by clicking the “Add to Compare”. Then if they want to view their products, click on the “Cart”. Customers flexibly change the display styles to view the product as list or grid. HOW UDETOR WORKS FOR SHOP OWNER? Step 3: Choose “Import Demo Data” and click on “import” button to start your installation. LearnDash: is the most trusted WordPress LMS, the best choice of 500 Fortune companies, major universities, training organizations, and entrepreneurs worldwide fo creating (and selling) their online courses. Easily create & sell courses, deliver quizzes, award certificates, manage users, download reports, and so much more! By using LearnDash you have access to the latest e-learning industry trends for creating robust learning experiences. LearnDash LMS – Event Espresso: You can associate your online courses to live events so that when users register, they are auto-enrolled. Frontend Course Creation: with the Front-end Course Creation Plugin, you can create a ‘Course Author’ user with special privileges. A Course Author can create and manage courses, lessons, topics, and quizzes, right from the front-end! Udetor Content Elements: Each of content element has been carefully crafted by our web design professionals and all you have to do is just drag the element into your page to launch your website. 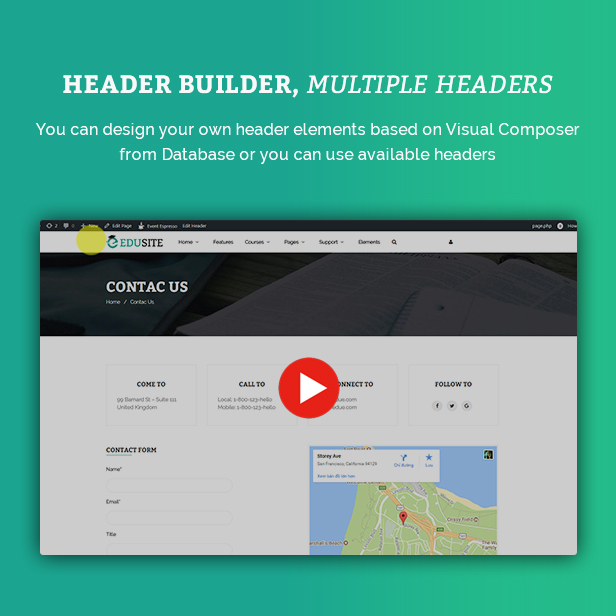 Header builder, multiple headers: You can design your own header elements based on Visual Composer from Database or you can use available headers. 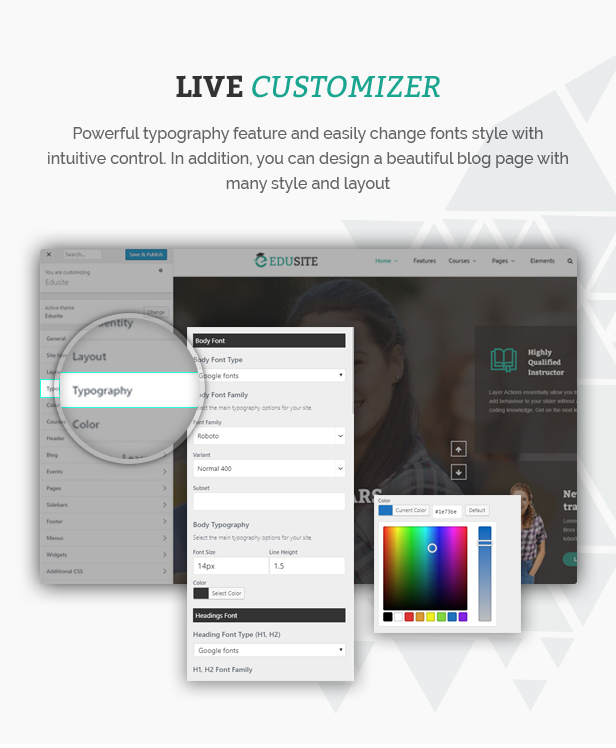 Live Customizer: Powerful typography feature and easily change fonts style with intuitive control. In addition, you can design a beautiful blog page with many style and layout. 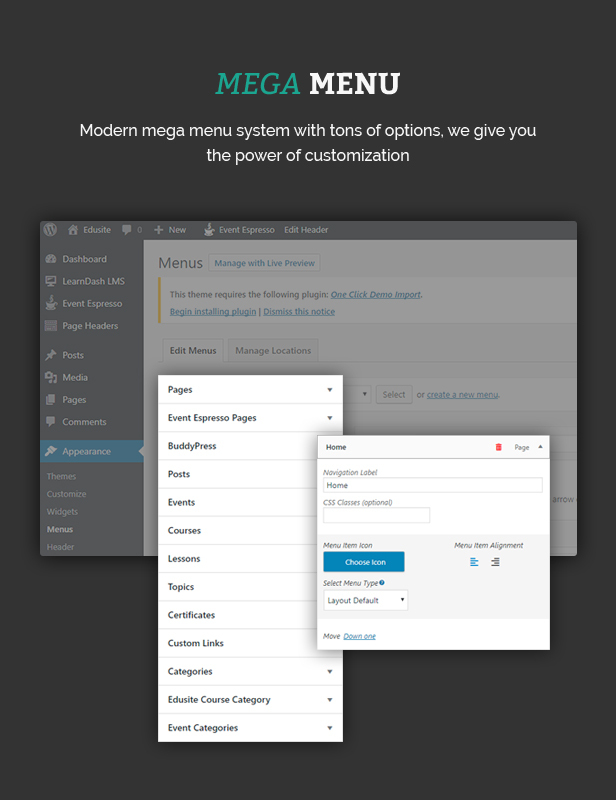 Mega menu: Modern mega menu system with tons of options, we give you the power of customization. Grid view/ List view: With two different layouts of the category page, customers can choose Grid view/ List view to view the post as they want. Many ways show content: There are many post header variants, multiple archive types and numerous gallery types. Each post and each category can be styled individually. 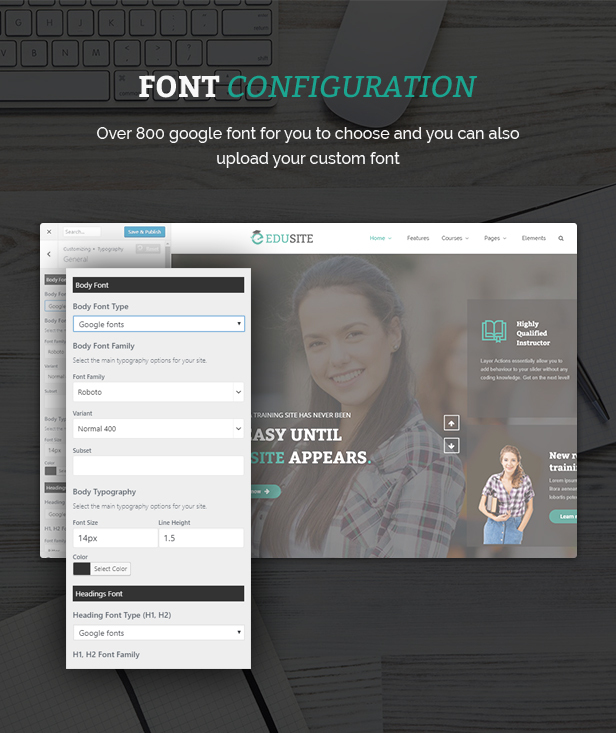 Font configuration: Over 800 google font for you to choose and you can also upload your custom font. Custom theme color: You can select and set dozens of color for elements which are used on our custom Color Picker. Event Management: This function helps you to sell tickets for events, workshops, training course, conferences and concerts and helps attendees register for classes. Sidebar layout: Udetor has many options to show sidebar to suitable your demand. 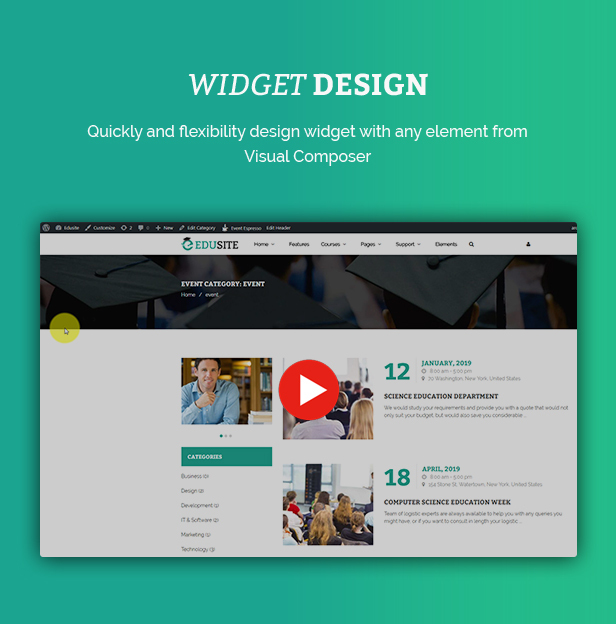 Widget Design: Quickly and flexibility design widget with any element from Visual Composer. Buddy Press: Enable registered members to create profiles, have private conversations, make connections, create and interact in groups. Additional content formatting features: To make your content look beautiful, we added additional content formatting features such as drop caps, lead-ins, and paragraph containers. MailChimp for WordPress: This feature helps you add more subscribers to your email lists by using various methods. Shortcode Mapper: No more shortcode copy/paste. Add any third party shortcode to the list of VC menu elements for re-use. Edit params, values and descriptions.